With the rash of superhero movies hitting theaters year after year, it’s easy to see that people love watching strong figures battling hard against overwhelming odds while helping the world in the process. While she might not be superhuman (as far as we know), 10Fold’s Michele Nachum is certainly a super person. 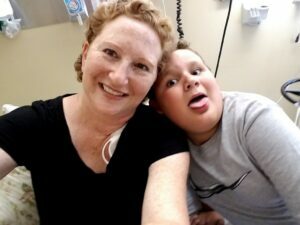 Michele, a public relations professional and mother of one, has been nominated as Woman of the Year by the Leukemia and Lymphoma Society (LLS), largely due to her victory over Hodgkin’s Lymphoma and her efforts to inspire and help other patients—even in the grips of the cancer herself. LLS is instrumental in funding drugs and therapies for patients battling leukemia and lymphoma, which indirectly helps other cancers—and was crucial in Michele’s own battle and recovery. After spending some of her early career managing PR in-house for the Long Beach Aquarium and Disney’s California Adventure, Michele dove back into the PR agency world. She consulted for various firms (including us), specializing in tech, and eventually joined 10Fold in 2019. In the spring of 2017, Michele came down with what seemed like a cold. However, it turned out to be something that would never have crossed her mind: Hodgkin’s Lymphoma. To this day, she says, it still hasn’t really hit her that she had cancer. When she learned the initial treatment would be three months of chemotherapy, the biggest worry on Michele’s mind was losing her hair. It all seemed so surreal. Three months of chemo evolved into a year and a half, and it still wasn’t enough. This would be the part of the movie where the hero is struggling to rise after being beaten. True to script, Michele rose. She received a stem cell transplant from City of Hope in Duarte, CA —a grueling yet successful treatment that sent her on the path to recovery. With time to reflect, Michele realized two things particularly helped her with the entire process: maintaining her life as best as she could, and the help from her circle of support. Throughout the treatment, Michele kept working wherever and whenever she could. Doing nothing was her kryptonite, after all. When health allowed, she would walk her dog, cook, take her 8-year-old son to school, and complete other normal, day-to-day tasks. Getting on with her life and doing things helped her feel more like a person rather than a guinea pig—making the struggle just a little bit easier. But the massive outpouring of support from her friends, family, and community had an even larger impact. Initially anxious about telling people—ironic for someone with years of PR experience—Michele created a Facebook page to keep her friends and family updated. Over time, that page grew into a community that provided all kinds of support she never expected. It evolved from a simple communication tool into a blog where she could share her experiences, insights into her struggles, and “chemo selfies.” Offline, her friends and family stepped up to help with every aspect of her life, including bringing her meals and sitting with her during chemo. Since her recovery, Michele is dedicated to paying it forward, having realized the effect kindness can have on others. Whether it’s helping a friend grieve the loss of his wife by delivering him food, giving advice to people with lymphoma or going through stem cell transplant, or even helping someone with their copay, Michele wants to help. To her, it adds a bit of meaning to life—and every little bit helps. Now, she’s not the one receiving advice and support—she’s giving it. And her impact was such that her friend nominated her for LLS’s Woman of the Year award. The award itself is secondary to what it can accomplish; for the next nine weeks, Michele is raising as much money as she can to support LLS with a $50,000 donation goal. In addition to funding research that has saved lives, the organization also helps with patient copays and programs to help patients go through treatment. Helping to raise money for it would be one of the best ways that Michele can pay it forward. Rarely is anything incredible accomplished by a sole individual. Even superheroes need help, whether it’s from a group of friends or an entire planet that supports and believes in them. Michele won her battle not with super strength or speed, but through the empowerment of the support and belief of her family and friends—and she helps others in their own battles by sharing her story, giving support, and entertaining with her quick wit. Despite all the radiation and chemotherapy, Michele can’t move mountains or fly (again, as far as we know), but she can help save lives in her own way. She is a super person, after all. If you would like to donate to Michele’s fundraising page, please visit https://pages.mwoy.org/calso/los19/mnachum.